Being a British Expat it has to be TEA! Strong, hot, with milk and occasionally with a spoon of sugar. Builders tea. Funny when living in London what did I drink – cappuccino, latte, etc from large take away cups from trendy coffee bars. Now having a proper (as I deem it) cup of tea has more significance. Here in the Netherlands, tea is made by a quick dip of a tea bag of no strength into luke warm water – whether herbal or black tea. And served without milk. I can drink tasty herbal tea or fresh mint leaves diffused by hot water but I gotta to have strong tasty black tea to make what I consider a proper cup of tea. Again tea bags or tea leaves I like I have to bring back from UK or Ireland of have imported from tea specialists. Hence why a good cup of tea has more significance whilst living overseas. I hear you! I am always surprised at how much coffee there is in England, when I consider it the land of tea, and always do a high tea when there. 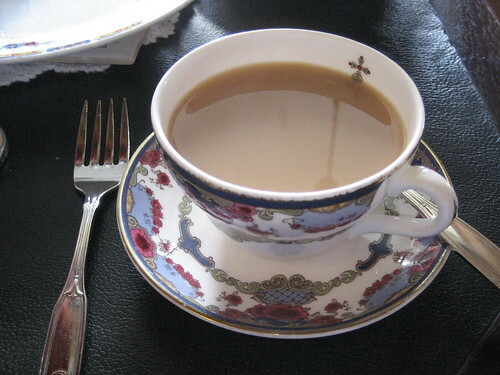 What is bizarre is that here in the Netherlands they love English style High Tea yet still don’t serve a proper blended cup of tea such as Darjeeling etc. And I must try the clotted cream!